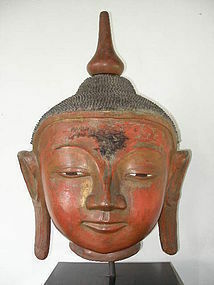 Very Large Dry Lacquer Buddha Head, 19th Century, rare! Very rare and giant size dry lacquer Buddha head mounted. Origin: Shan State. Very nice smooth patina, some signs of age, but very nice overall condition (the "Ushnisha" or flame, is removable and probably from a later date, as is typical of such venerated images). 19th Century, Size: H. 30" (76 cm.) x W. 24" (61 cm.) x D. 16" (41 cm.). This is a very striking art object with fine quality workmanship. Extremely hard to find such large heads, strong visual impact!